Mick my tench fishing mate had a terrible time on Horseshoe last week. Not a bite for 3 days and nights. Him and his mate Lee didn’t see a single fish! I know it’s been hard. I had planned to fish for two days this week again for the tench. Winter bay was going to be my starting point, however the swim I wanted was taken. I had taken notice of the wind direction before leaving home, they said that as the rain arrived on Wednesday the wind would switch direction by 180 degree so I had to move to my second favourite. I had put out some spomb mix of small seeds and sweetcorn. About 10 loads went out to the gravel patch. After casting out (9am) the required 60 yds I set about making camp for the two days. I faced the wind for Tuesday but with it being warm it wasn’t a problem. The bivvi was positioned to be protected from Wednesdays weather of strong winds combined with heavy rain. My rigs were maggots on a helicopter rig and a swim feeder. The same as I used with David and Jordan the week before. At 12.30pm one of the rods roared off and I connected with a fish that fought really well, probably too well for a tench. Eventually I landed a very nice little carp of 11lbs plus. This must have been one of the stock fish that went in last year. It’s good to see that these fish have settled in OK. They have put on about 5lbs in one year which is good news. With this one caught I recast again and soon enough I had another that broke the hooklink. So I changed the hooklink to braid of 12lbs and a size 14 hook and guess what. I hooked another of just under 14lbs. So two carp and no tench.. I saw one roll when I first arrived but nothing. I think they are still in the deeper part of the lake. I don’t know it’s difficult this year. I met a nice chap called Jay from Liverpool who hadn’t fished the lake before. I tried to help him select a swim but with so few carp coming out my advice was far from perfect. I had one very strange thing happen when I was looking into the lake. A pike came through the swim in water less than 12″ deep. I first saw this pike chomping on something, then I realised that it was tangled in one of my lines. One of the rods was nodding away with the alarm sounding. It had swam through the swim and had the line in it’s mouth and was trying to get rid of the stuff, twisting and turning. Finally the line came free. I gingerly reeled in and inspected the line to find no problem with it. I have had the occasional problem before where I had tried to pull into a bite only to have the line part. Could this have been the cause in the past? So the sun shone and guess what, nothing happened all evening or night. I had changed the rods over to popped up corn and boilie on the other as darkness arrived. The reason was that the tench often take boilies during the night. At 3am with the wind really blowing I was glad I had positioned the bivvi in a now sheltered spot. The rain started to pour and it turned out to be a really rough few hours. At 7 am one of the rods roared off and out I shot from the warm cosy sleeping bag and bivvi and lifted into a strong fish, this was no tench but a brown monster. The wind rushed by and howled in the trees the line sang to me too. With no coat on I was soon soaking wet making just slight gains on the fish as I drew it closer. It was so dark with the clouds and pouring rain I could hardly see into the depths of the lake to spy my catch. Soon though a black back and golden flank drew slowly over the net. So with the weight being 25lbs 4oz I was pretty happy. It’s not a tench though! Jay took a few photo’s for me too. Thanks a lot buddy! As we were talking the rod was off again but this time the fish came off after a few seconds. As I was reeling in the other rod roared off, I handed Jay the other rod and played another fish that gave me a good run around. I didn’t think it was a tench but probably one of the smaller carp. Sure enough a smaller carp of about 12lbs came to the net. Jay was only down for a few days fishing Horseshoe and a long drive from Liverpool meant he couldn’t fish it that regularly. I suggested that when I moved out later in the day he moved into the swim. He didn’t need to be asked twice. Within another hour I got out to have a pee when the rod roared off again. This time I missed the fish. I tend to use small hooks so perhaps they are not penetrating? I had been putting small amounts of bait out throughout the morning via the spomb, even with the rain pouring down and the wind roaring. Most other carpers that I could see stayed shut in the bivvi. At about noon I had one more bite that gave me a right old tussle, taking line and putting a right old bend in the rod. With the wind blowing hard from left to right it was quite difficult in judging how much pressure was being put on the small hook and hook hold. The wind combined with yet another soaking of rain it was difficult in spotting the fish close in. The waves and ripples were causing the difficulties. 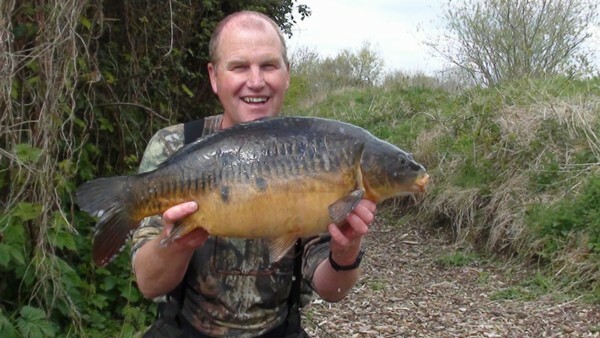 However soon i saw a great black back and golden flank of a carp as I pulled it over the net. In she went no problem. Just as I put her safe prior to taking a photo of the fish Jay arrived and couldn’t believe it. So with no tench around I suggested he gets his rods and start fishing the swim. On the scales the carp went 24lbs 8oz. These older carp have perfect colouration and scale pattern. So as I slowly packed away my tackle Jay was cast out and hoping to get on the carp too. He will probably get a 10lb tench!!! It was a great session but no tench has left me wondering. I still think they will start to come out of winter bay soon. I think that they are two weeks late! This entry was posted on Wednesday, April 25th, 2012 at 8:39 pm	and is filed under Uncategorized. You can follow any responses to this entry through the RSS 2.0 feed. Both comments and pings are currently closed.